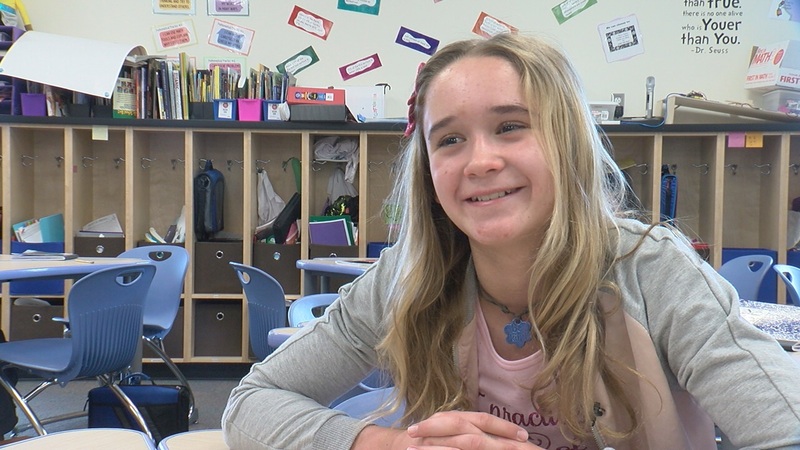 5th grade student in Oro Valley challenges local TV station to show more "good news"
&quot;My teacher is having us write to a subject we are passionate about. She says writing has power. I want the news to be positive because if people learn about the good things they will do good things,&quot; wrote Kaitlyn Prince. TUCSON, Ariz. — At KGUN9 we sometimes get letters from viewers, but one recently stood out from the pack. It was addressed to the promotions department and it was from a local elementary school. "My teacher is having us write to a subject we are passionate about. She says writing has power. I want the news to be positive because if people learn about the good things they will do good things," wrote Kaitlyn Prince. Kaitlyn is a 5th Grader at Innovation Academy in Oro Valley. She wrote to KGUN9 as part of a school project. She is challenging the station to show more "good news." We reached out to Kaitlyn's teacher Niki Tilicki to see what she thought of the letter. "I had a little tear up. It was exactly my goal," Tilicki said. "I want to connect the kids to the community because if I teach them to take care of the community, then when they grow up I know it will be a great place." There are signs of kindness all over Mrs. Tilicki's classroom. It's something incorporated in her lessons even when it comes to the toughest subjects. "9/11 is the biggest example I can think of," Tilicki said. "For me it was very difficult. It's my hometown. I grew up in New York and to share that with students... it's Mr. Rogers. Look for the helpers. And that's really how I want to share those stories with my students." Tilicki teaches her students to practice intentional kindness, which means you wake up and do something nice on purpose. The idea is everywhere at the academy, including a tree made of Ben's Bells kind notes. Kaitlyn says she often sees people holding the door for others and that getting a kind note made her really happy. The letter below from Kaitlyn inspired KGUN 9 to launch a new program highlighting the positive things happening in our communities and in our neighborhoods and recognizing the people that are spreading kindness by doing nice things for others. We are asking you to tell us about people you know, children, adults, local businesses, who should be recognized as "Kindness Ambassadors" so that we can share their positive stories and inspire more random acts of kindness in our world. If you know someone who is making Southern Arizona a better place, tell us about them and they may be featured in a future story.